In the middle of July, I found myself headed for Calgary, Canada. I had been invited by some Clean Energy Advocates to make a speech at their clean energy speaker series. Calgary is in Alberta and yes, that is where the Tar Sands are. Did you know that the so called overburden of those sands is Boreal Forest? I didn't go see them but apparently you can see it from space anyway. Calgary is pretty nice in July. We had a great dinner down on the river a few blocks from the Hotel the first night I was there. Next day, I started early with an interview on a popular radio show at 6:45. My speech was at noon, and apparently it sold out. And the audience was not the choir. One person had a copy of a letter from the Chairman of the Texas PUC bemoaning how Texas wind had dropped prices so much that the market could no longer support the building of fossil fuel plants. He didn't seem to understand that that was a good thing. The idea of the visit was to share with Albertans how Texas, an oil and gas state, has become a great renewable energy state... and to lay the foundations and create a roadmap for how Alberta can do the same thing. To put it mildly, it’s not easy to shift something as deeply entrenched as an electricity system. You need a willing public, committed entrepreneurs, and supportive policy, which helps create the needed business case. But above all, you need elected leaders willing to get the ball rolling, and stick with it. Which is what they had in Texas, back in the early 1990s, according to Michael Osborne. “You’ve got to give credit to the leadership of politicians, of both stripes,” said the cofounder of the Texas Renewable Energy Association at “America’s Clean Energy Maverick: How and Why Texas Grabbed the Renewable Energy Bull by the Horns,” a sold-out lunch event that we hosted last week in Calgary. As outlined in the presentation below, Osborne shared the story of the politics and policy that have made Texas a renewable energy leader. More than two decades ago it was Governor Ann Richards, a Democrat, who first invited renewable energy developers to the table. She determined renewable energy had a role to play in the state and established the Sustainable Energy Development Council to advise on making it happen. But Texas was just getting started: the next governor (and future President), Republican George W. Bush continued to redefine Texas as not just an “oil and gas state” but an “energy state,” and when he deregulated the electricity market and put in place a Renewable Portfolio Standard. Bush’s successor, and the current Governor, Rick Perry—another Republican—built on the momentum by creating Competitive Renewable Energy Zones, a system of transmission lines designed to bring the state’s renewable energy bounty from all corners of the state to Houston, Dallas, and other cities. And this leadership has paid off. Texas now leads the United States in wind power with 12,354MW of installed capacity, and the state has blasted through the targets set in the Renewable Portfolio Standard by a country mile (5,880 MW by 2015; with a goal of 10,000 MW by 2025). As Osborne noted, this growth hasn’t just meant a cleaner power grid, it has created 12,000 jobs in the wind sector and 4,000 jobs in the solar sector—and Texas shows no signs of slowing down. The most recent Electric Reliability Council of Texas’s (ERCOT) Long Term System Assessment, a biennial report submitted to the Texas Legislature on “the need for increased transmission and generation capacity throughout the state of Texas,” found that—alongside natural gas—about 17,000 MWs of wind and 10,000 MW of solar power would be built in future years. As Osborne said, “solar is the new wind”, and with plummeting prices it seems likely that photovoltaics will continue to surpass wind in global energy investment, as the sector did for the first time in 2013. From the Calgary luncheon to the government briefings we had in Edmonton, Michael Osborne proved open and insightful about his state’s accomplishments, and his perspective on how Alberta could similarly reap the benefits of its renewable energy bounty. 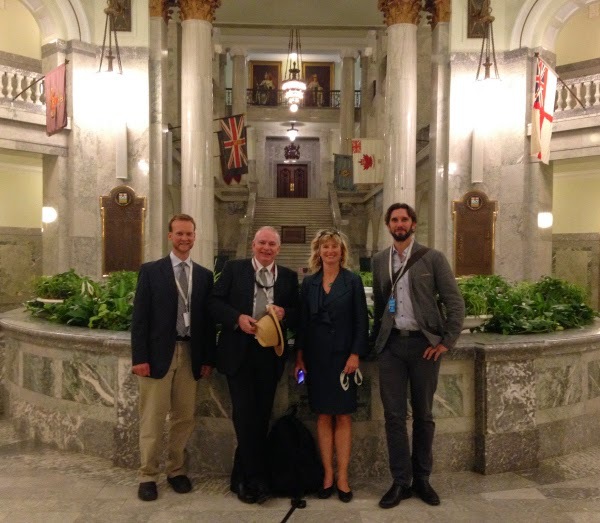 The next day we worked the capitol in Edmonton, we worked the press, the opposition, and the Minister of Energy. I have to tip my hat to the folks at Clean Energy Canada. They work hard and they work smart. but it just might become a little less Brown.